In a country famous for epic cuisine, one Spanish region reigns supreme: Basque Country. Nestled in the Pyrenees along the French border, the Basque region - which for centuries tried to establish itself as an independent nation - has a culture and personality uniquely its own. Bordered to the east by the Bay of Biscay, a gulf of the Atlantic, Basque Country is heavily influenced by the sea. Fresh seafood is a quintessential part of the cuisine, often flavored with a rich hodgepodge of Spanish and French ingredients. Unlike other coastal areas however, the Basque region is also fertile ground for livestock, vegetables and legumes. Grilled meats and rich stews are also staples of the Basque diet. Truly, surf and turf at its finest. With access to such diverse, high quality ingredients, it’s not surprising that the Basque people take food very seriously. Though it spans just over 8,000 square miles, the Basque region is home to 38 Michelin-starred restaurants, including four with the coveted three-star rating. If you’re a gourmand who hates to share, you’ll feel at home here. Order up some pintxos, small tapas-style plates built for one. They’re a fixture on virtually every bar menu and are also enjoyed as street food and midday snacks. Ready for a bite of Basque Country? Try these simple, traditional recipes for Basque food at home any night of the week. Fresh anchovies are a key ingredient in many Basque pintxos. This classic is worth a trip to the fish monger, though canned will do in a pinch. Lightly dust tomato chunks with paprika. Place five whole parsley leaves on each anchovy, then loop the fish over to form a horseshoe shape. Skewer a pepper onto one end of a toothpick. Follow with the anchovy, a piece of tomato and finish with a stuffed olive. Repeat with remaining toothpicks and ingredients. Drizzle finished gildas with olive oil and sprinkle with smoked salt. Great restaurant dining doesn’t come at the expense of home cooking in Basque country. This earthy soup is perfect for chilly nights. In a large saucepan or Dutch oven, warm oil over medium heat. Add half of the garlic and sauté until fragrant, about 3 minutes. Add potatoes, cayenne, water and remaining garlic; stir to combine. Bring mixture to a boil then reduce to simmer, covered. Continue to cook until potatoes are falling apart, about 45 minutes. Using a potato masher, gently mash potatoes until just a few small chunks remain. Season to taste with salt and pepper. Stir in parsley and cook for 5 more minutes. Ladle soup into bowls and serve garnished with piment d’espelette, if desired. *Piment d’espelette is a seasoning made from dried espelette peppers, native to the Basque region. Look for it in specialty stores or online. 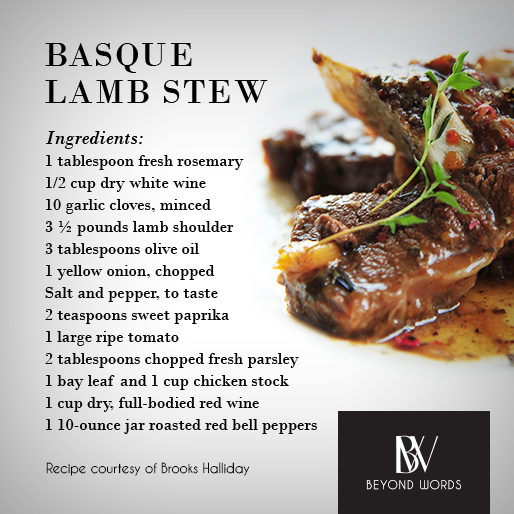 Adapted from Chef Daniel Boulud, this one-pan wonder showcases bold Basque flavors. In a large skillet, cook chorizo over moderate heat until lightly browned, about 5 minutes. Transfer chorizo to a plate using a slotted spoon. Add olive oil to any rendered fat in the skillet. Season chicken with salt and pepper, add to pan and cook over medium high heat until well browned on both sides, about 15 minutes. Transfer chicken to plate with chorizo. Add bell pepper, onion, garlic and thyme to the skillet and cook over moderate heat until barely softened, about 5 minutes. Add tomatoes, sherry, paprika and crushed red pepper and cook for another minute, scraping up any browned bits from the pan. Return chicken and chorizo to the skillet. Cover and simmer over medium low heat, turning occasionally, until the chicken is cooked through, about 25 minutes. Raise heat to medium and cook, uncovered, until the sauce is slightly thickened, about 10 minutes. Transfer chicken to a platter. Spoon sauce over chicken and serve garnished with basil. Salt cod, or bacalao, is a staple of the Basque diet. Follow the 24-hour soaking method below to prep the pantry-friendly standby for virtually any recipe. In a large bowl, submerge cod completely in cold water. Allow to soak for 24 hours, changing the water every 6 hours (changing the water ensures the fish won’t be too salty). Once soaked, shred fish into small pieces, removing any bones or cartilage. In a large saucepan, heat oil. Add onion, sauté for 3 minutes, then add garlic and sauté for an additional minute. Add the cod and tomatoes; stir and cover. Simmer for 10 minutes. Add olives, capers, cloves, cayenne and cinnamon. Stir until well combined. Simmer for another 2 minutes, then add parsley and boiled potatoes. Season with salt and pepper to taste and remove from heat. Serve in a shallow bowl with a chunk of crusty baguette on the side. This hearty dish is a great weekend recipe. It makes enough for lunch and/or dinner all week and it freezes beautifully. In a large bowl, combine rosemary, white wine and half of the garlic. Add lamb and marinate for 2 to 3 hours, ensuring meat is completely submerged. Drain lamb and pat dry with paper towels. Discard marinade. In a large, heavy-bottomed pan, heat 1 tablespoon of oil. Working in batches, brown lamb on all sides and season with salt and pepper, adding oil as needed. Set aside. To the same pan, add remaining olive oil and chopped onion. Sauté until fragrant, about 3 minutes, then add garlic and sauté an additional minute. Return the meat to the pan with the onions and garlic. Stir in paprika, roasted peppers, tomatoes, parsley, bay leaf and red wine. Bring to a boil. Reduce heat to medium and simmer uncovered for 15 minutes, allowing the liquids to reduce slightly. Add the chicken stock, bring to a boil, reduce heat to low and simmer, covered, stirring occasionally, until meat is very tender for about 2 to 2 1/2 hours. Ladle into bowls and season with salt and pepper, to taste.